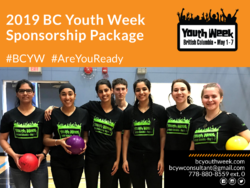 A big thank-you to our 2019 BC Youth Week sponsors. Thank-you for supporting youth accross BC! This is a great opportunity to be involved across the province. You will be able to communicate to young people and their families and friends that you care about what youth have to offer and say. We look forward to the possibility of partnering with you over this fantastic cause! Find out more below, view our 2019 sponsor package or fill out our sponsorship application. Have any questions? Please contact us. Support BC Youth! Become A Youth Week Sponsor today. 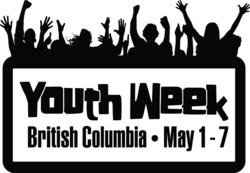 Support BC Youth Week by making a financial contribution. Every bit helps! Make a contribution through PayPal and support BC Youth Week. Please Note: Transaction will appear as ABBYYOUTH on your financial statement. We are unable to issue a charitable tax receipt for this contribution. Opportunity to publish a blog post / interview featuring your business / organization and chance to promote up to 2 opportunities, including photos and links.